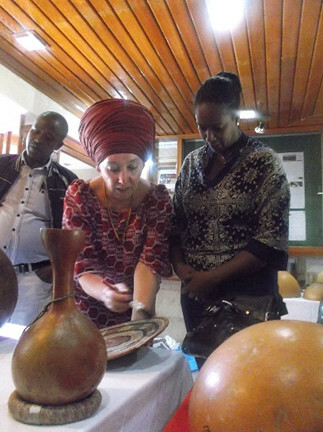 Heidi Cutts working with the Ethiopian National Museum staff (photo credit: ILRI). Current archeological findings show that Ethiopia has some of the oldest chicken fossils in Africa, indicating a significant bio-cultural heritage of chickens in the country. This heritage needs to be recorded and studied before it is lost because of modification, hybridization or outright replacement due to chicken breeding programs. The African Chicken Genetics Gains (ACGG) project, along with partners, aims to address this challenge through the Going Places Project. Going Places is an innovative pilot project which combines the fields of arts/humanities and science, to generate, analyze and record vital data on local Ethiopian chicken breeds. The findings of the program will provide actionable data to decision makers, engage and educate stakeholders and serve as an input for bigger projects. As part of a fact finding and data collection mission for the project, a four-member team visited Ethiopia in February 2017. The team consisted of Alison Foster, tasked with analyzing bone shapes of indigenous chickens to ascertain regional differences; Ophelie Lebrasseur, who focused on genetics; Holly Miller, interested in analyzing ecomorphs and their relationship to diet; and Heidi Cutts who worked closely with the National Museum of Ethiopia and its educators on outreach programs and on curating materials for display related to women and chickens. According to Miller, in addition to the scientific study of genes and bone structures, ‘it is really important to understand the cultural associations with the “habesha” (local breed) chickens. The habesha chickens, despite all the problems associated with disease and the like, have survived and adapted in Ethiopia and they are what make the human-chicken relationship in Ethiopia’. 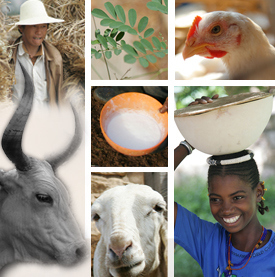 Lebrasseur added that ‘it is important to see how the current ecotypes and particular phenotypic traits of chicken came to be preferred by the people of Ethiopia’. This analysis will be an invaluable input for the ACGG project. 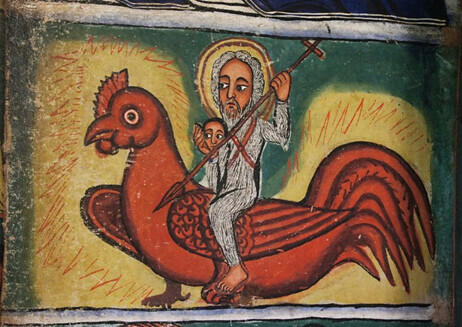 Abune Gebre Menfes Qidus, an Ethiopian Saint, riding a red chicken. This painting highlights the religious aspect of human-chicken interactions in Ethiopia (photo credit: ILRI). Cutts observed that, in Ethiopia, the human-chicken interaction seems to have a religious aspect. During a visit to a local church, she said that during a visit to a local church, she saw ‘a picture of a saint, Abune Gebre Menfes Qidus, riding a red chicken …and four chickens in front that he is sending forth to get rid of the devil’. Cutts believes that this unusual iconography illustrates the significant heritage of chickens in Ethiopia. During the trip, the team also visited the National Museum where they measured and photographed an assemblage of modern chicken bones from Tigray. According to Foster, they also ‘acquired one bone element from 20 chickens that (they) hope are relatively local to the Addis area,’ which will be compared to modern day chickens of the Tigray region. The Going Places project team will later analyse the collected samples in England and will be back in Addis Ababa at the start of June 2017 to present their findings. Tags: Archeology, communication campaign, Going Places. Bookmark the permalink.